Leadership practitioners and those who seek to develop leadership are concerned with whether they are using evidence-based best practices to develop leadership capacity in themselves and others. Are we indeed using best practices in the study, practice, and development of leadership? This book seeks to draw attention to the limitations of extant work on leadership, and to provide suggestions for a way forward. Presenting chapters on topics ranging from research methodology, gender and cross-cultural issues in leadership studies, and the role of the humanities in our understanding of leadership, the book represents a rigorous multidisciplinary collaboration. 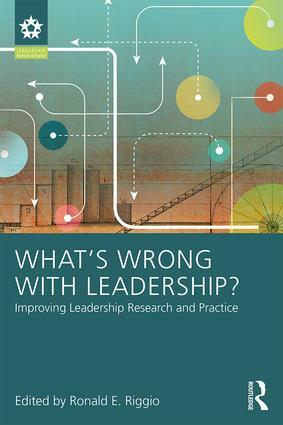 This is a must-read for graduate students studying leadership, leadership consultants and trainers, leadership scholars, and anyone who practices, teaches, or seeks to develop leadership. It will help expand the horizons of how we think about and practice leadership. Ronald Riggio, Ph.D. is Henry R. Kravis Professor of Leadership and Organizational Psychology at Claremont McKenna College. The Leadership: Research and Practice Series includes both edited and authored volumes showcasing the latest leadership and behavioral research, as well as practical books based on the latest leadership theory with applications to Industrial/Organizational Psychology, Management, Organizational Behavior, Law, Political Science, and Military Psychology. Please send all book proposals to Georgia Sorenson (gs546@cam.ac.uk), Ron Riggio (Ronald.Riggio@ClaremontMcKenna.edu), or Christina Chronister (christina.chronister@taylorandfrancis.com).